Nevada is this week's state postcard! (I know, I'm a bit behind!) Nevada is a beautiful state with deserts and mountains and wildflower fields with a complicated history of mining, ghost towns, gambling, ranching, and other more "sinful" connotations. I struggled with this one. In the end, I decided on a simple landscape of the rocky dessert with neat rock formations. As with many of the western states, Nevada has a diverse landscape and it was an interesting challenge to pick one and illustrate it. Week 5 was Oregon. Week 4 was Washington. Week 3 was Alaska. Week 2 was Hawaii. Week 1 was California. More about the 50/50 State Postcard Project. Happy Friday! 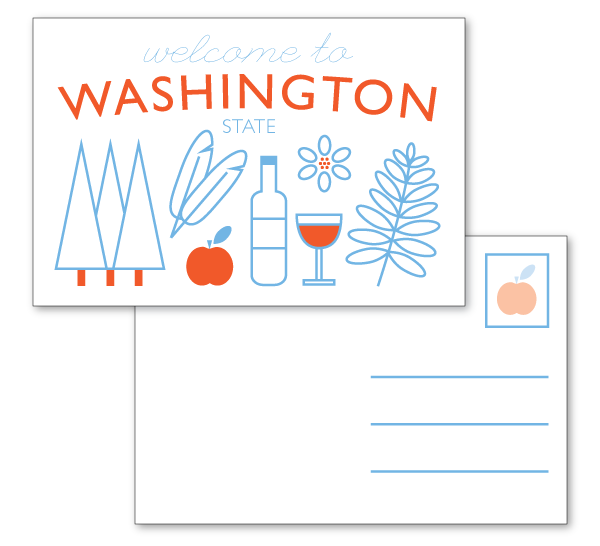 I'm playing catch up with the state postcard project. #4 is beautiful Washington state, not to be confused with our Capitol on the east coast. While researching Washington, I learned some interesting facts including that they are the #2 wine producing state after California. Who knew! As always, fitting a whole state on a standard 4" x 6" postcard is a bit of a squeeze, but a fun challenge nonetheless. I hope this card reflects a bit of the rich culture and state of Washington. Last week was Alaska. The week before was Hawaii. The week before was California. Today I'm introducing a new personal project that I'll be posting weekly to the blog. The 50/50 Project, or 50 State Postcards in 50 weeks, is where I'll share a new original state postcard that I created. I've decided to use it as a fun creative project to explore illustration and as an opportunity to learn more about all the states. I'll be posting the first entry today, and each new state will appear on Wednesdays. States will start in the west and move eastward. It's the third week of the year, so this project will run through the end of 2018. I'm excited and a little anxious about such an ambitious project, but it's all for fun, to learn and practice my illustration and design skills and learn some new tidbits about the states. I hope you enjoy it. If you feel so inspired, join me on this journey! If you do, please post a link and use the hashtag #5050postcards. There are no rules to join in. Go at your own pace, start at whichever state you like, maybe starting with your home state. Use any medium(s) you prefer. I'd love to see what you create! Again, if you join in, add #5050postcards to your posts on social media.